There are numerous ferry crossings operating from Sporades Islands to Skopelos Island. Ferries currently connect 2 ports in Sporades Islands with 2 ports in Skopelos Island. There are a combined number of 20 ferry crossings each day across a selection of 6 Ferry Routes which are operated by 4 ferry companies including Hellenic Seaways, Golden Star Ferries, Anes Ferries & Aegean Flying Dolphins with the shortest crossing taking around 15 minutes (Skiathos to Glossa (Skopelos)). This is a general summary of the services on offer between Sporades Islands and Skopelos Island, for live information select from our Fare Search. Skopelos is a Greek island in the western Aegean Sea, in the Northern Sporades archipelago within the Thessaly region. Shaped like a saxophone, Skopelos is one of the most charismatic islands in Greece, mostly known for setting the scenes of the Hollywood film, ‘Mamma Mia’ in 2008. 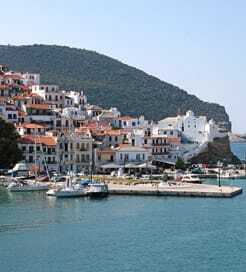 Two of the standout settlements, Skopelos Town and Glossa, offer terracotta-topped, white-washed houses amongst steep, beautiful slopes, affording wonderful panoramic views of the Aegean. The nation’s hub for wine production in Ancient times, Skopelos is, today, one of the country’s greenest spaces, with pine-clad hills, countless olive groves and bursts of colour from flowers lining the narrow, cobbled streets. Like most Greek islands, it’s easy reach to Skopelos by ferry, with plentiful domestic crossings on offer from the surrounding islands and mainland cities. The routes are operated by leading Greek operators, with some journeys last just ten minutes.